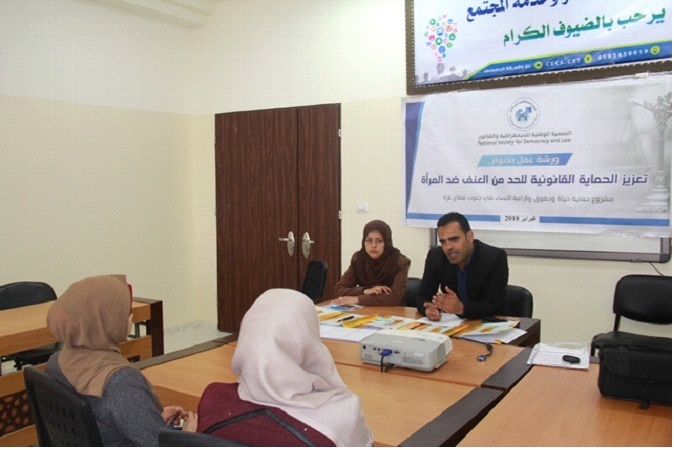 National Society for Democracy and Law carried out a workshop entitled “Promoting the Legal Protection in Reducing the Violence against Women” in Khanyounis at College of Science and Technology with in the project of “Protection of the Life, Rights and Dignity of Women in the Southern of Gaza Strip” and with the support of “Sawasya ” UNDP/UN Women/UNICEF Joint Programme : Promoting the Rule of Law in the State of Palestine. The participants were a group of the college students. Mr. Ali Moamer, public relation officer at the College, opened the workshop welcoming at National Society for Democracy and Law, its executive director Ms. Olfat El Bream and the lawyer Mr. Thaer Al Akad. 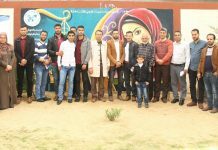 He also talked about the role of the National Society for Democracy and Law in supporting the Palestinian society in particular the southern Gaza Strip. 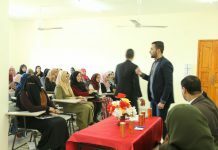 In addition, he emphasized its role at rising the awareness and he expressed the readiness of the college to embrace the next meetings. Then, Ms. Olfat El Bream started her speech welcoming with the college students. She talked about the legal clinic and its services which presented to the vulnerable groups. 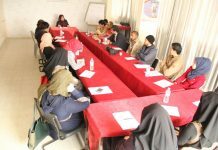 She also addressed the important of the project which contained this workshop to support the vulnerable groups and to access to the justice. 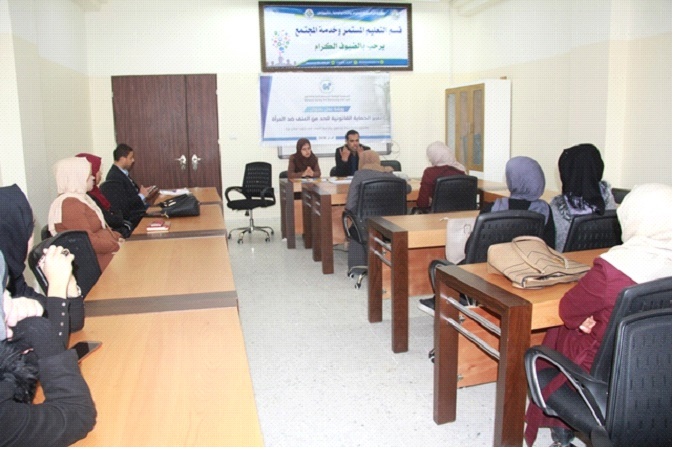 Furthermore, Mr. Thaer Al Akad talked about the forms of violence which experienced by women in particular Palestinian woman from Israeli occupation. Palestinian women also faced another form of violence from the society and the relatives as a result of customs, traditions and the weakness of some laws. He presented these laws and appealed to amend and enact new ones to adapt with the new Palestinian condition. Particularly, These recent and applied laws are old in the justice field. Some of them were during the Othman Empire in 1954 as personal status and the code of family rights. Moreover, he pointed out the Palestinian penal code which issued in 1936 by British Mandate. This law came as mitigating for the criminal act on the honor issue in the particular article 18. He emphasized that some of the articles of these laws consider a violation of women rights and injustice within the violence against them. We should make a serious stand to re structure these laws to stop the violence against woman. Al Akad spoke about the formal justice agencies represented at the police, prosecution and courts. He pointed out the types of courts, such as regular and sharia courts and its specializations. He talked about the informal agencies, such as Reform Committees and Mukhtars and he called for following the law. He also refused some practices from the persons who are responsible for the justice agencies which reducing the woman rights. 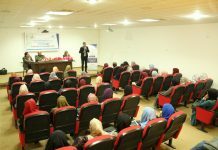 He completed his speech with the treaties and conventions which acknowledged at the rights of woman and protect them in the peace and war such as Universal Declaration of Human Rights , CEDAW, Palestine joined to it in 2014, and special resolution 1325 about the peace and security to woman. He also called for the necessity for harmonization the Palestinian laws with these laws. At his final speech, he reviewed some of statistics talked about the violence and attacks on women at the last year. He added the woman caused a harm to herself because she ignores her rights and let up requesting her rights. At the end, the discussion opened for students and it was a positive discussion. The students asked questions about the discussion issue and the lawyer replied about them. Moreover, the discussion suggested a lot of recommendations to work on them in the next stage.